Once Christmas is over and you finally get around to taking down your seasonal decorations, you're probably going to wish you had somewhere to store your artificial Christmas tree. Instead of trying to shove it back in its original box, make your life a little easier and invest in a Christmas tree bag that's specifically designed to help you store your faux tree during the off-season. The right storage bag will protect your tree from mold, mildew, bugs, and anything else that might cause it to deteriorate. Plus, most Christmas tree bags are surprisingly affordable, so you don’t have to break the bank to buy one. Below, the top-rated Christmas tree bags that you can buy right now. One of the best Christmas tree bags you can buy is the best-selling Best Choice Products Rolling Duffel Holiday Decoration Storage Bag. This product comes with a host of thoughtful features that will make storing your Christmas tree easier than ever. 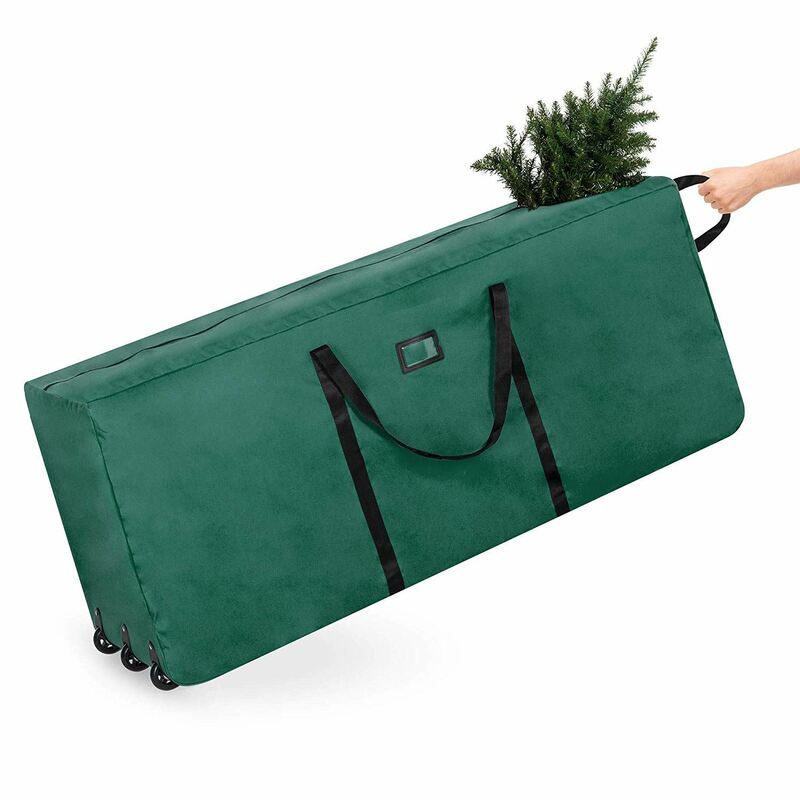 This bag can hold up to a 9-foot artificial Christmas tree, and there are internal straps to keep your tree from moving around and getting damaged. It's made from the heavy-duty, tear-resistant material that will protect your tree from dust, mildew, and rodents, and the bag has three wheels and reinforced handles to make it easy to move your tree into storage. Overall, it's a worthwhile investment to make storing Christmas decor easy and efficient. This bag is made from waterproof plastic, so it will protect your tree from mold, water damage, and pests. It can be used for artificial trees up to 7.5 feet tall, and it has reinforced handles that make it easier to carry. Reviewers say this is a great Christmas tree bag for the price, and it will fit not only your tree, but many decorations as well, making it easy to store everything away for the off-season. However, reviewers warned not to overpack the bag, as the seams are prone to ripping if put under stress. If you want to store your tree and other decorations in a sturdier container, you'll love the IRIS Holiday Tree Storage Tote with Compartment Lid. Unlike most Christmas tree bags, this container is made out of hard plastic, so you can easily stack things on top of it, making it more convenient if you have limited storage. This storage bin can hold Christmas trees up to 7 feet tall, as long as they break down into 4-foot sections. It has a lid that buckles into place to effectively keep out insects, dust, and anything else that might harm your tree, and there's also a built-in compartment where you can store smaller decorations, such as tree skirts or ornaments. Additionally, there are wheels on one side that makes this product easy to move. Reviewers say this is an easy and effective way to store your Christmas tree, but several warn you should measure the segments of your tree to ensure it will fit in the bin. If you have a big Christmas tree, you'll need a big bag to match. One of the best options for oversized trees is the TreeKeeper TK-10773 Greenskeeper Extra Large Christmas Tree Storage Bag. This top-rated bag can hold trees up to 15 feet tall, but it’s significantly more expensive than other options. This product features a steel frame that keeps the bag in shape, as well as polyester sides to protect your Christmas tree. It has compression straps to help you store the largest trees, and there are built-in Wheels to make it easier to move your tree from place to place. Reviewers say this bag is sturdy and well-made, and it easily holds the largest Christmas trees, along with additional decorations. If your Christmas tree and decorations are heavy, you may not want to heft a bag into your attic or basement. For this reason, many Christmas tree bags have built-in wheels that make them easier to move, and one of the best options you can find is the Primode Holiday Rolling Tree Storage Bag. This Christmas tree bag can accommodate a disassembled tree up to 9 feet tall, and it's made from a strong, tear-resistant polyester. The bag features reinforced handles that make it easier to move, as well as built-in wheels, so you can simply tilt the bag and pull it along behind you. Reviewers say this bag is very sturdy and can accommodate average-sized Christmas trees. Several recommend creating a makeshift frame to help the bag retain its shape, writing this will make it even easier to store your tree. If you want to be able to see what's in your Christmas tree bag, you need a product that has a clear window. One of the best options in this case is the Covermates Large Holiday Storage Duffel Bag, which can hold up to a 7.5-foot tree. This duffle bag is made from moisture-resistant polyester, and there are several sizes available to fit your storage needs. The bag features a reinforced strap that makes it easy to carry, as well as a clearview window so you can see exactly what’s inside without having to open it. Reviewers rave about these Christmas tree bags, writing the material is very sturdy and the viewing window is a valuable feature. Plus, many note that the bag is surprisingly easy to carry and does a great job protecting artificial trees from bugs. If you prefer not to disassemble your tree, you can buy an upright storage bag, such as the TreeKeeper Green Large Adjustable Tree Storage Bag. With this product, you simply pull the bag up over your tree and store it all in one piece. This upright Christmas tree bag is made from polyester and can fit most trees up to 9 feet tall. The bag attaches to your stand and compresses at the base (just hide it with a tree skirt) until you're ready to put the tree back into storage. You simply pull the bag up over your tree and close the zipper. Plus, there are reinforced handles if you need to move the bag. Reviewers say this bag is easy to set up and use, making it a great option if you want to store your tree upright. In addition to Christmas tree bags, there are also wreath storage bags that will keep your holiday decorations protected and in shape. The Premium Christmas Wreath Storage Bag is a highly-rated, affordable product that’s perfect for storing wreaths up to 30” wide. This bag is made from heavy-duty, waterproof polyester, so it will fend off pests, moisture, and dust. There are velcro straps inside the bag that hold your wreath in place, and it even has a card slot that allows you to label which decorations are inside. Reviewers say this wreath bag is huge and heavy duty, and many note the price is unbeatable.